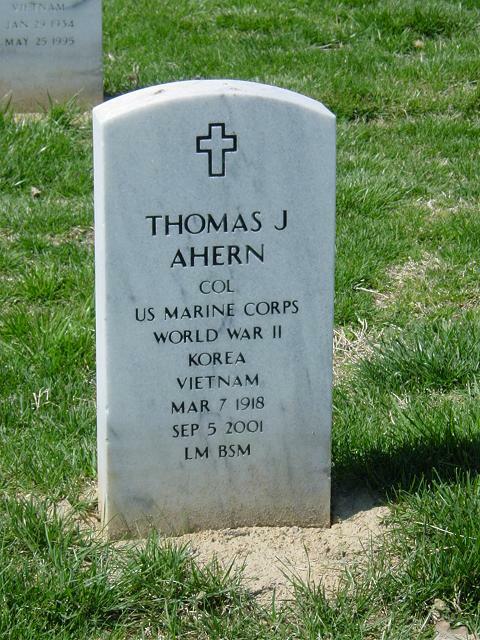 On September 5, 2001, Colonel Thomas J. Ahern, USMC, (Retired). Beloved husband of the late Rita Mary (nee Regan) Ahern; devoted father of Thomas Ahern, Jr., Mary Ellen (nee Ahern) and Brandon Leopold, and Stephen Ahern and Penny Watkins. Also survived by brother, Charles Ahern and sister, Ruth Shannon. Mr. Ahern was predeceased by brother, Robert Ahern. Colonel Ahern served on active duty in the Marine Corps from 1939-1966, flying combat missions in the Pacific during World War II and in Korea. His decorations included The Legion of Merit, two Distinguished Flying Crosses, The Bronze Star and eight Air Medals. A Mass of Christian Burial will be celebrated on Monday at St. John the Evangelist Roman Catholic Church, (Wild Lake Interfaith Center), 10431 Twin Rivers Rd., at 12 Noon. Interment Arlington National Cemetery, October 3, 2001 at 3 p.m.
Those who desire may direct memorials in Colonel Ahern's name to The American Lung Association, 1840 York Rd., Timonium, Maryaland 21093.